We cordially welcome you in Café Mozart! Café Mozart is a cozy meeting point in the heart of Frankfurt's city, only a few steps away from the "Zeil", Germany's most visited shopping street. Our café and restaurant offers all day dining. Enjoy a good cup of tea or coffee and have a break in a stylish atmosphere with friendly service. The range of our menu covers breakfast varieties as well as lunch and many tart and icecream specialities. Café Mozart in Frankfurt am Main. The Café Mozart was founded in 1915, almost 100 years ago and has been run for 26 years by us. 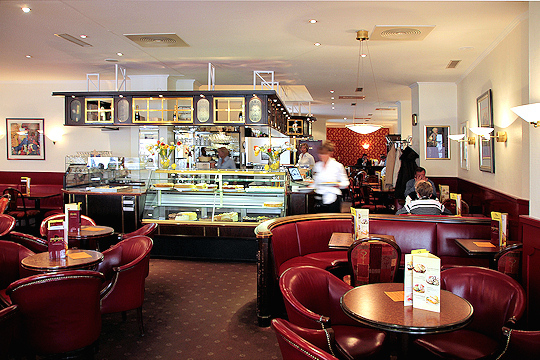 We wish you a comfortable visit in our Café in Frankfurt / Main! Café Mozart in Frankfurt am Main.